Set amidst 120 acres of tranquil woodland and delightful Suffolk countryside, our traditional & luxury self catering holiday lodges boast an excellent location close to the renowned coastal hotspots of Southwold, Aldeburgh and RSPB Minsmere. Our holiday lodges offer a scenic and peaceful retreat whilst remaining within easy access of our clubhouse and other facilities at High Lodge. 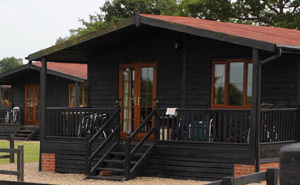 Lodges offer accommodation ranging from 2 berth to 6 berth. Our Clubhouse offers facilities for you to enjoy and if you want to use the restaurant or bar then we open for breakfast, lunches, snacks and refreshments 7 days a week. If you are feeling energetic then the 9 hole golf course will give you a challenge for both the experienced or novice golfer or why not try your hand at Clay Shooting? Our professional instructors will make sure you enjoy your experience. Fishing is also available from the lake in front of the lodges. And why not try our brand new activity – footgolf! All activities can be booked on arrival although at peak times it is advised that you book in advance, charges apply to activities. Fishing is available right outside your lodge and there is another lake available on site. To view our 2015/2016 price list for all types of lodge, please click here. Traditional two-bedroom lodges are positioned overlooking a lake in a beautifully peaceful location amongst woodlands and offer you stylish and comfortable accommodation – ideal for a truly enjoyable stay at anytime of the year. These lodges offer 4 – 6 berth; each one has double bedroom with en-suite shower room and one twin bedroom with an additional bathroom. For the 6 berth additional sleeping for 2 people is available on a sofa bed in the lounge area. 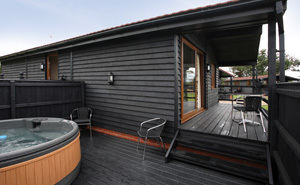 Executive luxury lodges with a private outdoor hot tub, positioned overlooking a lake in a beautifully peaceful location amongst woodlands offering you stylish and comfortable accommodation – ideal for a truly enjoyable stay at anytime of the year. These lodges offer 2 – 6 berths; each one has a master double bedroom with en-suite shower room and other bedrooms for additional berths, another bathroom is also available for the additional berths. The 6 berth, 3 bedroom lodges also have a larger extended dining area. Call us to check availability and book your Lakeview or Waters Edge holiday lodge. Call +44 (0)1986 784347 or contact us using the on-line enquiry form. In our Award Winning self-catering luxury lodges with hot tubs, set in grassland overlooking a well-stocked lake and woodland area. The lodges offer a scenic and peaceful retreat, each has a private balcony offering views over the lake with garden furniture for you to enjoy. For the comfort of all guests lodges are non-smoking. Why not explore the surronding Suffolk area while you’re visiting us at High Lodge. Suffolk has so much to explore whether it’s food and drink or exploring the countryside and history of Suffolk. A range of activity breaks, including Golf, Fishing, Archery, Air Rifle Shooting and a “Premier Plus” Clay Pigeon Shooting facility, making it one of the top UK shooting venues, is available for everyone from beginner to the most experienced. We also offer Hen & Stag Activity Days!